So finally we have moved the rabbits out of their pen, and I have the thumbs up to build a track down the side of the garage; the space is 5.1m x 1.2m at one end, and 1.6m at the other - the latter end also has a 600mm gate there (on the side closest to the garage). I'd be keen to see anyones ideas for a design to fit in that space. Suzuka and Paramount Raceway could be made to fit in that space. That is about the shape of my space (my track is in the Qld section) - there have been some threads on the forum about the suzuka track I can send you some plans I have collected if you want. 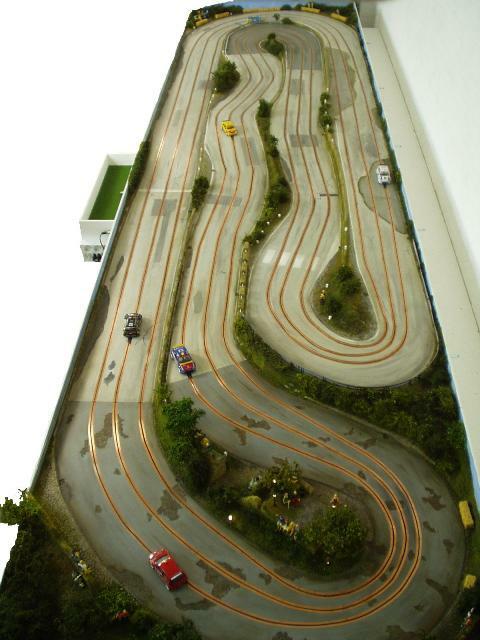 If I was starting again I would make something more like this track - that is on a 1.2m x 4.8m table. The reason I would make this is my current track is essentially a look with a cross-over my fastest cars are runnng 4.5 sec laps - I would prefer a longer lap time (maybe double that) and the visual appeal of the cars travelling up and back twice. Does that make sense. I am not sure where I saw it but one idea I liked is a raised back straight with pit garages underneath. Not as easy to build as a flat track but good for use of space. Outside the box looking in. You don't own stuff: Stuff owns you! @DM: at first glance I wasn't so impressed with that track, but when I read the other forum, wow!! @FLY: that sounds like a good idea!